Kaspersky PURE far exceeds regular PC protection. It renders your PC highly immune to cyber threats of any kind. You can trust Kaspersky PURE to protect the integrity and privacy of all your digital assets. Kaspersky PURE keeps your computer in pristine condition and gives you complete peace of mind. The product consists of Kaspersky InternetSecurity, system backup and networking in the LAN. Kaspersky PURE keeps malicious content and spam at bay, whilst letting you manage access to your applications, email and the Internet. Additional security tools erase any data-trail, so hackers can’t follow. 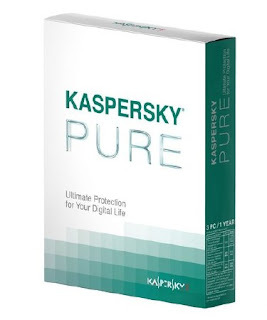 Kaspersky PURE prevents your photos, music, documents, videos, etc. from becoming lost, stolen or corrupted. Advanced backup tools and the latest encryption technology mean that you decide who you share your personal data with. Kaspersky PURE has everything you need to protect your digital identity. With a built-in virtual keyboard, the latest in anti-phishing technology and a secure password management system, it won’t let you down! Ensures family-safe content Kaspersky PURE puts you in charge of who uses the PC’s on your home network and what they can see and do, both online and off. Detailed reporting systems keep you fully informed and your family safe. Kaspersky PURE allows you to check your network’s security status, automatically download and roll out updates from a nominated PC, log events and organize scans and backups from any point on the home network. Kaspersky PURE is the one-stop-shop for home network protection. It contains everything that you need to manage your network’s security and to keep it malware-free, without the need to be an IT expert. Try this method to reset ur kaspersky pure.. Step 5. Change the last 3 digits of the binary dat to 3 different digits. Step 6. Exit Regedit and restart for changes to take affect. Now u r free frm tht bloody key blacklisting isuues..
Download kaspersky application frm the original site itself..
here s the link "http://www.kaspersky.com/pure-trial-register"
do you have any kaspersky pure activation key?